Granite tabletops add elegance and luxury to the decor, however this sleek stone cannot be placed on just any table base. The heavy weight of granite requires adequate support. 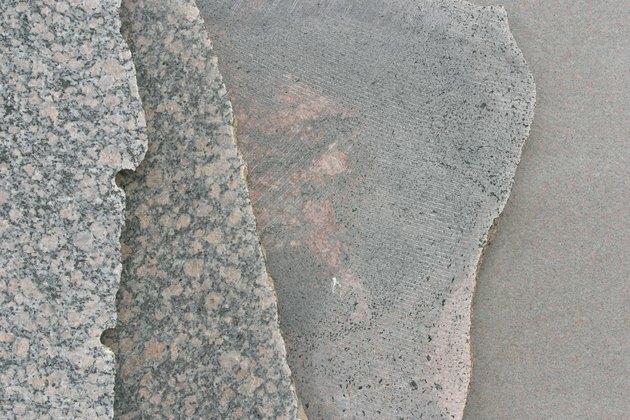 Beyond securing the granite to a base that will support its weight, its appearance must match the grandness of the granite as well as the room decor. A heavy granite tabletop needs a strong base. Cast iron columns make a stable base for a granite top and adds a touch of vintage flair to the decor. Cast iron will not bend or warp under the pressure of the granite's weight, and the cast iron's weight helps stabilize the table. A base constructed of several allows the weight of the granite to be evenly distributed across the columns. This lessens the burden on the columns and the stress on the inflexible granite top. One column may be enough of a support, dependent upon the diameter of the granite. The decorative, sometimes ornate style of wrought iron complements granite's elegance. Wrought iron can be custom-fabricated to fit almost any design taste and style. However, wrought iron is neither as heavy or as sturdy as cast iron, so the engineering of a wrought iron base is integral to its support capabilities. Its top must be level, and the entire unit must be perfectly balanced, with and without the granite table top in place, or it may be crushed under the granite's weight. A sleek, unadorned steel or stainless steel table base adds a contemporary appearance to a granite table top. While steel is slightly lighter than cast iron, it does bear its own weight and provides adequate support for a table top even in a single-column version. However, steel would be more suited for a multiple-columned base. Additional columns reinforce the design and weight of the table, distributing the granite's weight evenly, even when leaned upon or moved. The play of wood against a granite tabletop gives the stone a warm, rustic appearance. The best wooden base for a granite tabletop uses 4-by-4 inch wood posts built into a strong frame whose leg are supported with horizontal reinforcement bars. Wood also offers some flexibility in its design, such as working with commercial lumber pieces or using raw logs to form the base of the table. The addition of a sub-top -- a supportive base for the table top, usually made of wood -- plays an important function in the longevity of the granite table no matter which base style is selected. Without a sub-top, any stress applied to the table's area creates tension at the contact points of the table base below can, which may lead to the granite cracking, or even breaking in half. A sub-top acts as a bridge between the column contact points that evenly distributes the stress as a shock-absorber. It also provides a durable surface to fasten the bolts into, which then supports the granite from underneath.